I'm late posting part two. Then there was the clearing up; the marquee, the party and after Finn the horse. The band, "The Peat Bog Fairies" with Graeme on the keyboard were a tour de force. Now we want regular live bands in the Community Centre. A lovely ceremony, a great party and happiness all round. SCF (The Scottish Crofting Federation) is running a 2 Day introduction to crofting course in the village. Read on if you are already a crofter, if you are interested in getting a croft, or if you just want to find out more about how crofting works. This course is free to young people under the age of 18, or anybody who is claiming benefits. It costs £50 if you are a member of SCF, and £60 to everybody else. You can also pay the fee with an ILA. Normally these induction courses are run as night classes over several weeks but this is an opportunity to do it in a weekend. If you live in Lochaber, London or Sheffield you are welcome to join. The course will take place over a single weekend, 19th / 20th October. Starting at 9.30am on the Saturday morning and running through to the Sunday afternoon. There will be several field visits to crofts in and around Kilchoan each with a different approach to crofting. 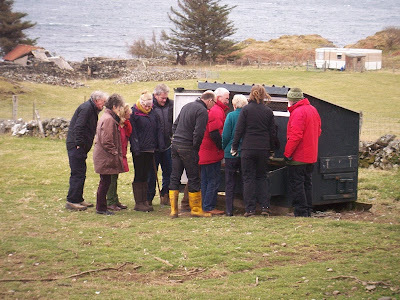 John Mackintosh, a Lochaber crofter with many years of experience will introduce the course.. He will hand over to Alan Boulton who runs Huntaway consulting, but in the past he has worked as a shepherd, a deer stalker, a ranger naturalist, a forester and an estate manager. Alan's current clients include crofters, farmers, Scottish Government agencies and conservation organisations. He has previously delivered a wide range of rural skills and Crofter training for West Highland College. Live "off grid" without TV, WiFi and neighbours. The Shepherd's hut is ready for its first visitors; complete with double bed, wood burning stove, solar powered lighting, kitchen and composting toilet. Neighbours include corncrakes (May / June), otters, ducks, geese, herons and sheep across the road. Mornings can be a little noisy because of the cockerels up at the croft but most of them will be in the freezer by next week. Otherwise the only sounds are the waves, the wind and thrushes beating snails to death on the roof..
Ben Hiant and Kilchoan Bay are framed in the doorway while the loo window overlooks the Sound of Mull , Ben Talaidh and the Morven peninsula. There's a good supply of dry firewood to fuel the wood burner and to keep you cosy. Ideal for a reading, walking, wildlife or idling weekend or week. Unfortunately...... there is mobile phone reception although you could just leave it at home; or in the car if you can't bear to be parted.